The Sketchbook Challenge: The sketchbook Challenge Book Blog Hop! 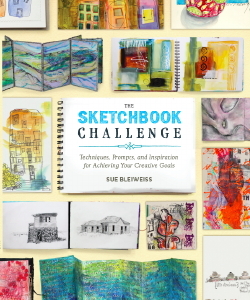 The sketchbook Challenge Book Blog Hop! The Sketchbook Challenge: Techniques, Prompts and Inspiration for Achieving Your Creative Goals Book officially releases today and we're celebrating it with a blog hop to give away over $1200 worth of prizes donated by some incredibly generous sponsors! Read on for details! Mistyfuse : Mistyfuse is giving away NINE packages of a 10yd combination package of Mistyfuse that includes 6 yards of White and 2 yards each of Black and Ultraviolet and a Goddess Sheet and ONE package of Three 10yd packages of Mistyfuse: a white, black and ultraviolet and a BIG Goddess Sheet. Sue Pelland Designs is giving away A Leaves Galore Grande size template , Quilter's Chalk Line, and the pattern of their choice from her website with free shipping (Continental USA). The Thread Studio is giving away a pack of machine embroidery threads and a pack of flaked gilding leaf. The Artist Cellar is giving away TWO complete sets (28 stencils each!) of Artist Cellar Stencils. So hop on over to the two featured blogs for today and find out what we're giving away! Would love to see the book. Does it contain new material or the blog posts from the sketchbook challenge? Shirley you can look inside the book on the Amazon product page. It's all new material in the book - it's not a reprint of the blog content. This sounds like a fun blog hop! I can't wait to see the book. good luck to everyone! How did I not know about The Sketchbook Challenge?! I will definitely follow you guys from now on. What fun!! Thanks to ArtPlantae for the info. Stressed out? Take time to sketch.